Windows Turnkey Console is the PUP that uses misleading techniques to prevent removal. Use Reimage to locate malicious components and get rid of them faster than with uninstall instructions. A full system scan blocks virus reappearance and prevents traffic to malicious domains. 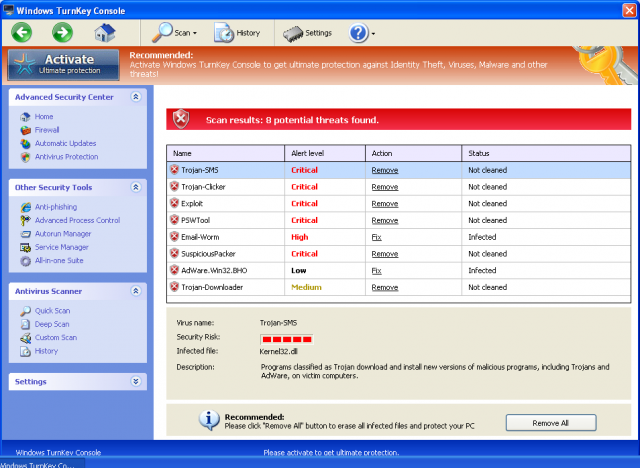 Windows Turnkey Console is a rogue security program that displays fake security alerts and pop-ups on the compromised computer to make users think they are infected with malicious software, for example: adware, spyware, rootkits and trojans. It also pretends to scan the infected computer for malicious software and reports system security threats that do not even exist or may be genuine Windows system files. Do not follow on screen instructions outlined by this rogue anti-spyware program; otherwise you can seriously damage the system. Do not give any personal information to scammers, do not fill in any forms and most importantly, do not purchase this bogus security program. It's promoted mostly via fake online virus scanners, infected websites and misleading ads. It may also be distributed via social networks and spam. Most of the time, the rogue program has to be manually installed, but sometimes it may be downloaded onto the infected computer using trojan downloaders and similar malware. One way or another, this rogue program should be removed from the infected computer as soon as possible. Also, it is very important to mention that this rogue security program may come bundled with more aggressive malware. 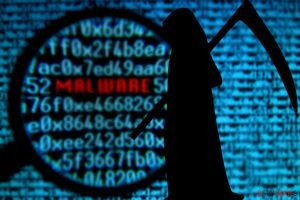 For example, you may not be able to install genuine malware removal software and your search results might be redirected to malicious websites. Not necessary malicious but there will be at least several ads for sure. While running, Windows Turnkey Console virus will block task manager and orher useful system utilities to make the removal process much more complicated. All atempts to open Task manager will trigger the reogue program and it will open its own process manager. Of course, it doesn't alow you to end malicious processes that would not make any sense. The payment page of this fake security program is also made to drive as much sales as it can, showing 30 days money return policy and huge discounts if you choose to purchase lifetime license. Firewall has blocked a program from accessing the InternetC:\program files\internet explorer\iexplore.exeis suspected to have infected your PC. This type of virus intercepts entered data and transmits them to a remote server. Attempt to modify Registry key entries detected.Registry entry analysis recommended. One more thing, the rogue program may be dropped with the rootkit infection. As you may know, such infections are sometimes difficult to remove. To remove all malware from your computer, please use malware removal software listed below. The most important part – do not pay for it; otherwise you will lose your money. Windows Turnkey Console will use various misleading methods to scare users into paying from malicious program. Instead of buying this software, please download and scan your computer with legitimate antimalware software listed below. It is very important to remove all malicious components of this malware. So, to remove Windows Turnkey Console, please download an automatic removal tool give below and run a full system scan. Once the virus is gone, you should be able to use your antivirus once again. Sometimes, there might be certain registry keys and values left in the Windows registry that may prevent antivirus software from installing or running. It's a good idea to remove those registry keys and values using CCleaner or other registry cleaner of your choice. This entry was posted on 2012-06-04 at 10:08 and is filed under Rogue Anti-Spyware, Viruses. You can quickly scan the QR code with your mobile device and have Windows Turnkey Console manual removal instructions right in your pocket. How did you remove Windows Turnkey Console?